I am slowly turning into my Mom because never in a million years did I think I would be making my own yogurt. But, in efforts to continue on my journey to less waste, I have decided to make the switch. I used to always think, “Why would I make it when I can just buy it?”. I guess that’s the point. We have so many products at our fingertips that it is so easy to not make and buy instead. However, this is a switch you will never regret; homemade yogurt tastes better and costs less! Individual, no waste, homemade yogurt parfaits! Bought bulk granola in my All cotton and Linen bag. After you make your first batch, you can use your own yogurt as the yogurt starter. This will help you develop your own “house” yogurt taste! If you are looking for a good yogurt to start with, go with a whole milk, probiotic yogurt brand. I love Nancy’s Whole Milk Probiotic Yogurt. 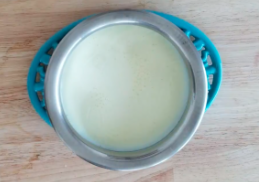 Warm the milk over medium heat for 12 – 14 minutes. Stay close and watch for the milk to slowly bubble/puff up. Let the milk cool for 45 minutes to an hour. Do not stir or mix. In a separate bowl, add 2 tablespoons of the pre-made yogurt. Once the milk has cooled for 45 minutes, spoon enough of it into the small bowl to cover all of the pre-made yogurts. Whisk well and add the mixture back into the pan. Mix well. Place the covered pan in a warm place. If your house is not particularly warm, you can turn your oven to 200 degrees for 3 minutes, turn the oven off and then place the milk inside. The yogurt will form between 18-24 hours. 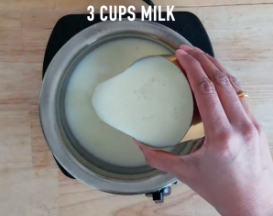 If you would like to make individual, no waste, yogurt containers, pour the milk mixture into your containers right after you mix in the yogurt starter. Then place them in a warm place.